Truth is often stranger than fiction, and in this slim yet powerful book, truth is much more horrible than fiction. Erik Loomis has done an amazing job of putting together a succinct history of labor's struggle against corporate power. He shows that when the federal government started to finally enact safety laws, and unions were gaining more rights for workers, corporations just moved manufacturing overseas. Once out of the U.S. they are able to skirt safety regulations and pay minimum wages as low as thirty-two cents an hour. Five million U.S. jobs have been lost due to NAFTA, and new trade agreements just enable U.S. corporations to continue their policy of exploiting the poorest on this earth. I don't call too many books a must-read, but this one is certainly worth your time and money spent. When jobs can move anywhere in the world, bosses have no incentive to protect either their workers or the environment. Work moves seamlessly across national boundaries, yet the laws that protect us from rapacious behavior remain tied to national governments. This situation creates an all-too-familiar "race to the bottom," where profit is generated on the backs of workers and at the cost of toxic pollution. 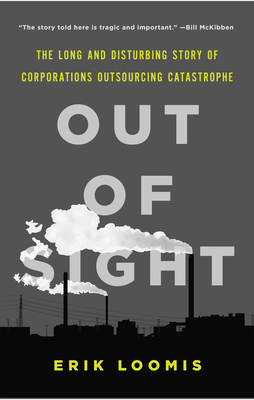 In Out of Sight, Erik Loomis--a historian of both the labor and environmental movements--follows the thread that runs from the Triangle Shirtwaist Factory Fire in New York in 1911 to the collapse of the Rana Plaza factory building outside of Dhaka, Bangladesh, in 2013. The truth is that our systems of industrial production today are just as dirty and abusive as they were during the depths of the industrial revolution and the Gilded Age, but the ugly side of manufacturing is now hidden in faraway places where workers are most vulnerable. Today, American capitalists threaten that any environmental regulations will drive up the cost of production and force them to relocate our jobs to a country where they don't face such laws and can re-create their toxic work conditions. It wasn't always like this. In his insightful book, Loomis shows that the great environmental victories of twentieth-century America--the Clean Water Act, the Clean Air Act, the EPA--were actually union victories. This history is a call to action: when we fight for our planet, we fight for our own dignity as workers and citizens.